Stand in the middle of the vast redwood forests and you may feel like you have stepped back in time. It’s hard not to be amazed when staring at Earth’s tallest living things. And that feeling continues everywhere in the park. Whether strolling along the beaches or hiking in the woods, visitors are in awe of the natural surroundings, abundant wildlife, and quiet peace. Redwood National Park is a reminder of what can happen when we don’t protect our lands and why it is so important to continue to conserve them. Old-growth redwood forest used to cover more than 2,000,000 acres of the California coast. At that time, about 1850, Native American lived in the northern area until lumbermen and gold miners discovered the area. Many trees were logged to areas like San Francisco that were gaining popularity. In 1918, the Save-the-Redwoods League was formed in an effort to conserve the area, and by 1920 many state parks were established. Redwood National Park was created in 1968 even though about 90 percent of the original redwood trees had already been logged. In 1994, The National Park Service (NPS) and the California Department of Parks and Recreation (CDPR) combined the park with the three Redwood State Parks to help stabilize and conserve the area. Temperatures range from 40 to 60 degrees year round along the redwood coastline making it a great place to visit any time of year. Summers tend to be mild with warmer temperatures inland. The crowds are heavy this time of year. Winters are cool and provide a different kind of visit, though there is a higher chance of precipitation. If you’re into bird watching, plan your visit during the spring to see migration at its peak. You may also want to consider a visit during the fall to catch amazing fall foliage. If you plan on flying, Crescent City Airport is the most convenient airport and uses United Express/SkyWest airlines. The Eureka-Arcata Airport is also used by visitors and uses Delta Air Lines/SkyWest, or Horizon Air. For those driving into the park, you will use U.S. Highway 101 whether you are traveling from the north or south. If you are traveling from the northeast, take U.S. Highway 199 to South Fork Road to Howland Hill Road. One of the best things about this national park is it’s free to visit! That’s right! 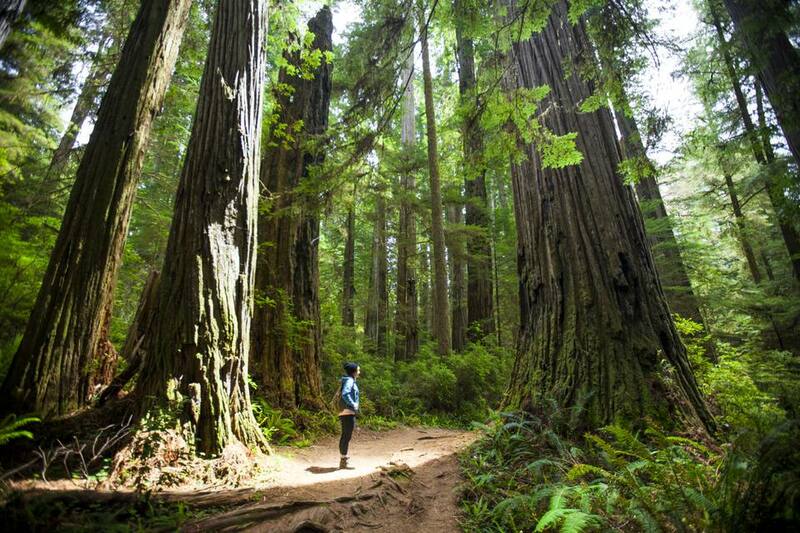 There is no entrance fee for Redwood National Park. However, if you plan on camping in the park, fees and reservations are requires. Call 800-444-7275 for more information or reserve a spot online. Backcountry sites also require fees and permits, particularly at Ossagon Creek and Miners Ridge. Lady Bird Johnson Grove: A great place to begin your journey in the park. The grove’s mile-long trail showcases giant redwoods, hollowed-out trees that are still living, and amplifies how quiet and serene the park is. Big Tree: It’s 304 feet tall, 21.6 feet in diameter, and 66 feet in circumference. Oh, and it’s about 1,500 years old. You get the idea of how it got its name. Hiking: With more than 200 miles of trails, hiking is by far the best way to view the park. You will have a chance to view redwoods, old growth, prairies, and even beaches. Check out the Coastal Trail (about 4 miles one way) for amazing shores, lagoons, and wildlife. In the spring and fall, you may even see migrating whales! Whale Watching: Plan your trip during November and December or March and April for peak migration months for viewing gray whales. Bring your binoculars and watch for their spouting at Crescent Beach Overlook, Wilson Creek, High Bluff Overlook, Gold Bluffs Beach, and the Thomas H. Kuchel Visitor Center. Dance Demos: American Indian dance demonstrations are presented by members of the Tolowa and the Yurok tribes. Every summer, visitors learn about the significance of each American Indian culture and view amazing dances. Call 707-465-7304 for dates and times. Education: Two in-park facilities are available by reservation for educational programs: Howland Hill Outdoor School (707-465-7391), and Wolf Creek Education Center (707-465-7767). Programs are offered during the day and overnight with a primary focus on wetland, stream, prairie, and old-growth forest communities. Teachers are encouraged to call the numbers listed above. Visitors may also contact the parks' education specialist for information about ranger-guided activities for children at 707-465-7391. There are four developed campgrounds—three in the redwood forest and one on the coast—provide unique camping opportunities for families, hikers, and bikers. RVs are also welcome but please note that utility hookups are not available. Jedediah Smith Campground, Mill Creek Campground, Elk Prairie Campground, Gold Bluffs Beach Campground are all first-come, first-served though reservations are recommended for camping at the Jedediah Smith, Mill Creek, and Elk Prairie campgrounds between May 1 and September 30. Reservations must be made at least 48 hours in advance online or by calling 800-444-7275. Visitors traveling on foot, bike, or horseback are also welcome to camp in the park’s extraordinary backcountry. Camping at Redwood Creek, and the Elam and 44 Camp backcountry campsites require a free permit, which is available at the Thomas H. Kuchel Visitor Center. Camping at the Ossagon Creek and Miners Ridge backcountry campsites also requires a permit, which is available at the Prairie Creek Visitor Center. Although there are no lodges within the park, there are many hotels, lodges, and inns located in the area. Within Crescent City, check out the Curly Redwood Lodge which offers 36 affordable units. Visit Kayak to search for more hotels near the park. Crater Lake National Park: Located about 3.5 hours away from Crescent City, CA, this national park is home to one of the most beautiful bodies of water in the country. With stunning cliffs towering over 2,000 feet above, Crater Lake is tranquil, stunning, and a must-see for all who find beauty in the outdoors. The park offers beautiful hiking, camping, scenic drives, and more! Oregon Caves National Monument: Travel only an hour and a half away and take a tour of intricate caves of marble bedrock. If you’re not much for the underground, don’t worry, the ground above is just as spectacular. With hiking and ranger-led programs, this national monument offers fun for the whole family. Lassen Volcanic National Park: If you have the time, take the 5-hour trek to this national park for some dramatic volcanic landscapes. There’s a lot to do here, including hiking, bird-watching, fishing, kayaking, horseback riding, and ranger-led programs. The 2,650-mile Pacific Crest National Scenic Trail also passes through the park, offering longer distance hikes.